ARLINGTON, Texas - All those Kentucky freshmen against a Connecticut team already with a few championship rings. After yet another game-winning shot from Aaron Harrison, the young Wildcats will have the first all-freshman starting lineup in an NCAA title game since Michigan's Fab Five in 1992. The Huskies are back in the title game for the second time in four years, providing a chance for a second ring for three seniors who remained even after coach Jim Calhoun's retirement and being ineligible to play in the NCAA tournament last season under coach Kevin Ollie. Eighth-seeded Kentucky (29-10) plays seventh-seeded Connecticut (31-8) Monday night in the first championship game since 1966 with two teams that weren't in the tournament the year before. The teams that year were Texas Western and Kentucky - the "Glory Road" game. Kentucky was the preseason No. 1 this season, but the coach John Calipari's young Wildcats had fallen out of the poll before the tournament began three weeks ago. They have responded by winning a series of close tournament games and are listed as an early 3-point favorite. Connecticut was ineligible last season because of academic issues and Kentucky played in the NIT. SOWN SEEDS: Eighth-seeded Kentucky and seventh-seeded UConn will make NCAA final history even before the clock starts ticking Monday. It will be the highest seed total to play in the title game since they started putting numbers by the names back in 1979 - the previous high when third-seeded UConn beat eighth-seeded Butler for the 2011 title. It's also the fourth time an eighth seed has made the championship game and the first trip for a seventh seed. The Wildcats and Huskies are far from mid-major darlings. They've got rich basketball traditions and star power, including Kentucky's Julius Randle and Connecticut's Shabazz Napier. The seeding is more of a reflection of each team's struggle during part of the season. Now each team is playing its best ball. Just don't call it low-seed magic. "I don't know about magical. We all just fight, we don't let the games go, and we know no matter what that we have a chance to win so we always try to keep fighting," guard Aaron Harrison said. COACHES SUCCESSFUL AT DIFFERENT STAGES: Connecticut coach Kevin Ollie is in his second season with his alma mater. Calipari is going for his second national championship. Calipari has a 43-13 record in the NCAA tournament, including a title two years ago with Kentucky. He has also taken Massachusetts and Memphis to the NCAA tournament. THEY STUCK WITH UCONN: Napier, Niels Giffey and Tyler Olander all were part of the Huskies' national championship season in 2011. Napier appeared in all 41 games as a freshman with the Huskies, averaging 7.8 points and three assists playing 23.8 minutes. He had four points, four rebounds and two assists in title game against Butler. Giffey also played in all 41 games, starting 10 of them, while averaging 2.2 points in 10 minutes a game. He had four points and six rebounds in the championship game. Olander started 21 of his 39 games in 2011, when he averaged 1.5 points and 1.8 rebounds a game. His role has diminished since then. COMMON OPPONENTS: Florida's Billy Donovan and Louisville's Rick Pitino should have the best insight on the title game. They are the only coaches to face both Kentucky and Connecticut this season. The Gators topped the Wildcats three times, sweeping Kentucky for the first time in school history, and lost to the Huskies twice. UConn upset Florida 63-53 in a national semifinal Saturday four months after dumping Donovan's team on a buzzer-beater. The Cardinals dropped both meetings against Kentucky, including a 74-69 victory in the Sweet 16. Louisville beat UConn three times, including an 81-49 game in the regular season finale. ROLLING WILDCATS: Kentucky hasn't lost an NCAA tournament game since losing to Connecticut in the 2011 national championship game. 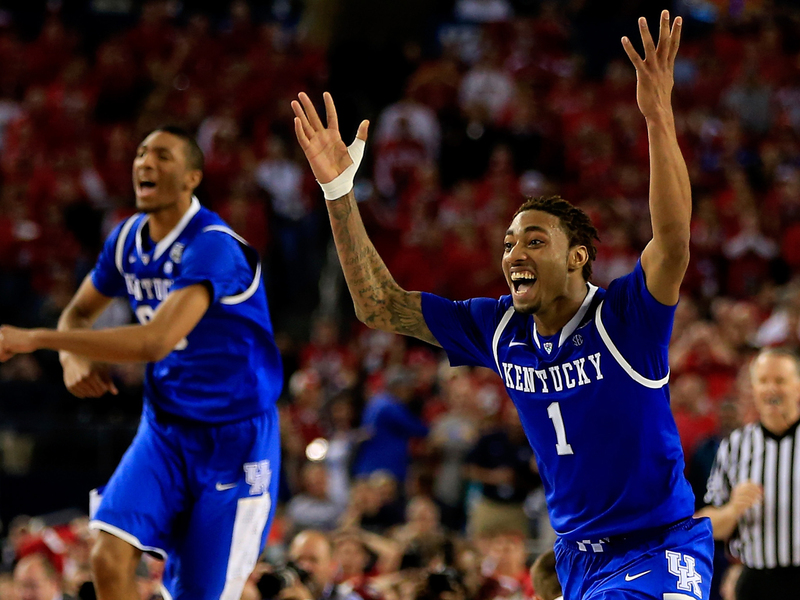 The Wildcats won the national title in 2012, and are 15-1 in the NCAA tournament over their past three appearances.